Learn everything you need to know about the various kinds of loans available to consumers. Don’t be intimidated to apply for a loan. By following these steps, a loan can be within your reach to finance your projects, purchases, and goals. When you're trying to save up for a big purchase, or for a huge goal like going to college or paying off debt, it can feel like you're trying to push a massive boulder uphill. Lots of hard work, but not a lot of progress. 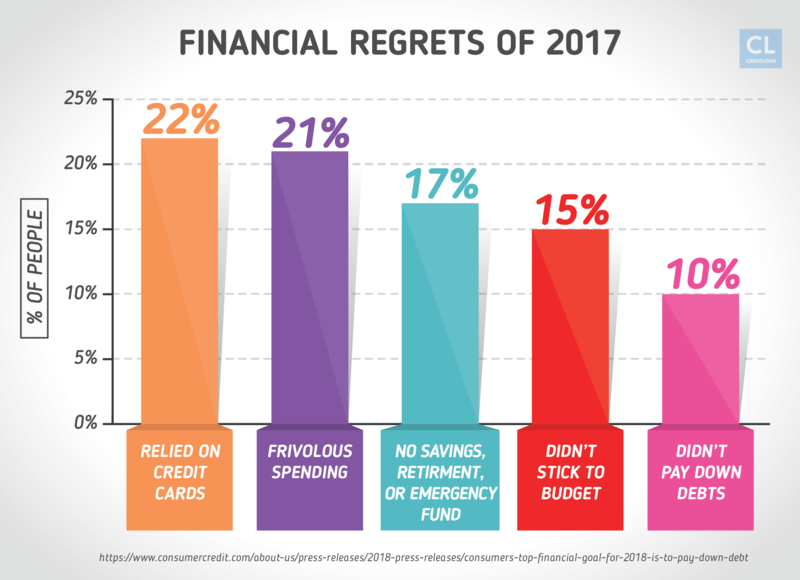 Saving money to eventually finance a distant purchase or goal sometimes feels hopeless, and often makes you feel helpless. There is help if you are willing to get a loan to secure the money you need to finance your dreams. The problem is, loans can be complicated and even intimidating. There is a lot of fine print, and not all loans are created equal. There's no denying it, loans can be helpful for big purchases or getting a college education. If you've got some existing debt you're paying a lot of interest on, loans can be a tool to save money and structure the payback. Everyone, sooner or later, is going to need to access a loan. It's, therefore, a really good idea to become familiar with how loans work. Loans don't have to be overwhelming. You shouldn't feel stress for borrowing money up front, so you don't have to put your dreams on hold. In fact, taking out a loan can be a boost to your financial standing in the long run. I've seen it happen over and over again here at CreditLoan.com. Over 200,000 customers have benefited over the past 18+ years from the education, tools, and solutions we've provided to help them meet their financial goals. 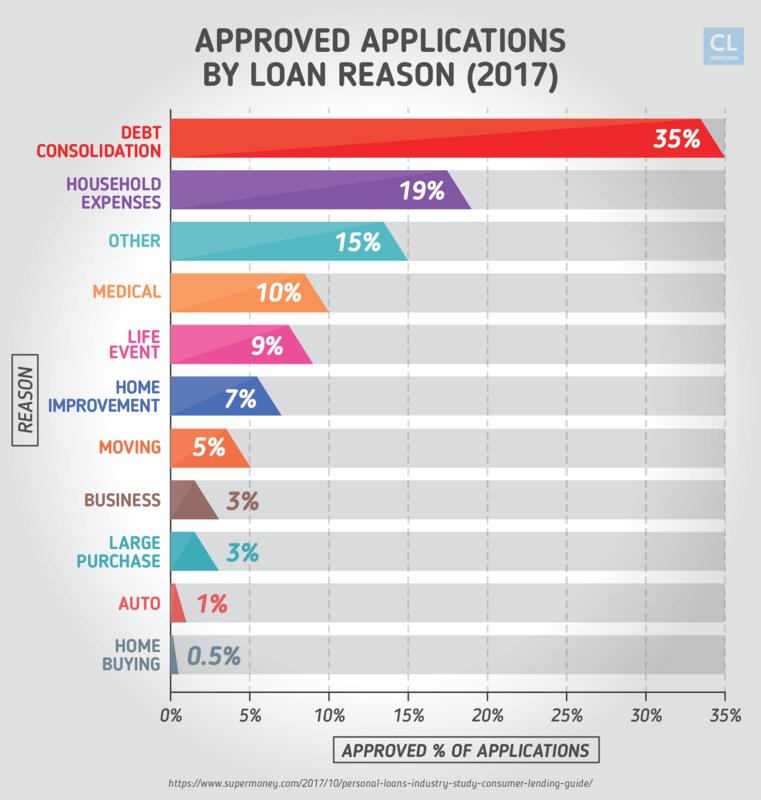 Loans are one of the top tools I recommend for dealing with existing debt, paying for college, or financing a big purchase. I've helped save for Christmas gifts, pay medical bills, and empower many young people to attend university. "Loan" shouldn't be viewed as a four-letter curse word. Loans should be used as tools to improve your financial standing, not hurt it. I'm always here for anyone who needs information on loans, their benefits, and advantages. Once you've checked out my step-by-step guide for making the most out of loans, you'll be able to confidently choose the right loan for you and your dreams. For every dream or life goal, there is a loan to help make it happen. The reason you're applying for a loan will determine whether it's a personal loan, a debt consolidation loan, a car loan, or a student loan you're looking for. The first step is to look at the reason you want to borrow money and decide which type of loan is best for your needs. There are about as many reasons to apply for personal loans as there are people on the planet. Some of the uses for personal loans might be unexpected. The specific, personal reasons for applying for a personal loan can fall into a few broad categories. Sometimes unexpected emergencies like medical bills or car repairs require you to come up with cash. Unplanned but unavoidable expenses happen. If you're like most people, you don't have hundreds or thousands of dollars lying around for a rainy-day emergency. Getting medical attention or driving your car are not options. They are necessities. You just need to figure out how to finance them. Pay-off an unplanned expense up front. If you have an unexpected car repair bill for $2,500, a personal loan can get you the money you need to pay it up-front almost immediately. Here's the math. When you plug that number into my handy loan calculator, you can see the proof of how it works for yourself. Keep up with the $115.93 monthly payments on that $2,500 loan and pay an extra $282.28 in loan interest at 10.49% APR (annual percentage rate, or interest rate) over 24 months. The interest will cost you only $11.76 per month. It's a small price to pay overtime to have your car back on the road immediately. Choose an early repayment option. It's recommended you choose a personal loan with an option to pay it off before the agreed-upon term length without penalty. Then you can either pay your fixed installment every month to eventually erase the debt or pay it off quicker in chunks or in a lump sum and pay less interest. Couples should plan to pay for the wedding they want. The planning needs to be balanced by calculating the wedding they can afford. Don't postpone a wedding for financial reasons. Sometimes, accessing a personal loan is the solution to making a dream wedding happen sooner rather than later. The average cost of a wedding in the USA is $26,645. Couples will usually spend between $19,984-$33,306 on their wedding day. It could take years to save that much. Rather than waiting, a personal loan can make the wedding day happen now. It can be paid back over time. Even calculating interest, the budget is still reasonable. Let's plug some hypothetical wedding numbers into the personal loan calculator again. For an average wedding costing $25,000, a personal loan can be taken out to cover the amount. Paying it back in monthly installments of $646.14 over 4 years (48 months) at 11% APR will cost $6,014.63 in interest. The total cost of the wedding, therefore, comes to $31,014.63. You're still a couple of thousand dollars beneath the top bracket for average wedding costs. Convenient and affordable financing. 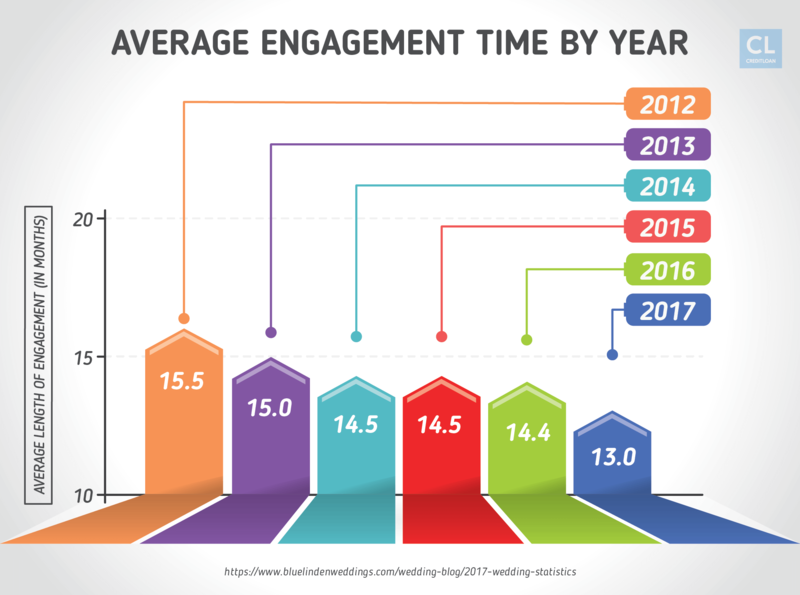 And you got to pay the wedding off over time at a reasonable interest rate, which is much better than having to cough up $25,000 cash up-front or putting expenses on a high-interest credit card. Personal loans can be a great solution to get the cash you need to make important projects and purchases a reality. It pays to go green. Perhaps you want to hire a contractor to install solar panels on your roof to help you save money on utilities in the long run. Vacations cost a lot, but the memories are priceless. Your family is probably overdue for the big dream vacation to Disneyland. Santa can't let them down. Maybe the holidays are coming and your kids' wish list is as long as your arm. By getting a personal loan to cover these important purchases and projects, you're able to make them happen. Credit cards are not the answer. With a personal loan, you don't have to max out a high-interest credit card. Do it now, not later. You can go on vacation, buy Christmas presents, or make energy-efficient upgrades to your home right now. No need to wait until you've put enough money aside. Take the time you need to pay it back. You can choose the payback period for your loan, usually from 12 months to 5 years. The interest is a small price to pay for making something special happen. It's true the memories of a dream family Disney vacation are priceless. When we do put a price on the interest to finance a vacation with a loan, it's very reasonable (especially considering the specialness of the experience). The average expenses for a family of four to travel to Disney World is about $3,500. The personal loan calculator shows us how $3,500 paid in $164.76 monthly installments over 24 months will only cost $454.17 in interest. Your kids aren't getting any younger. If you have to wait until you've saved $3,500 to take your kids to Disney, you might be dragging along teenagers. Paying less than $500 in interest over two years to make it happen right now is more than worth it. Another reason for needing a loan is to deal with existing debt. Just one debt, or all of the above. Whether it's just one big debt or a combination of several debts, it can be difficult and expensive to manage. 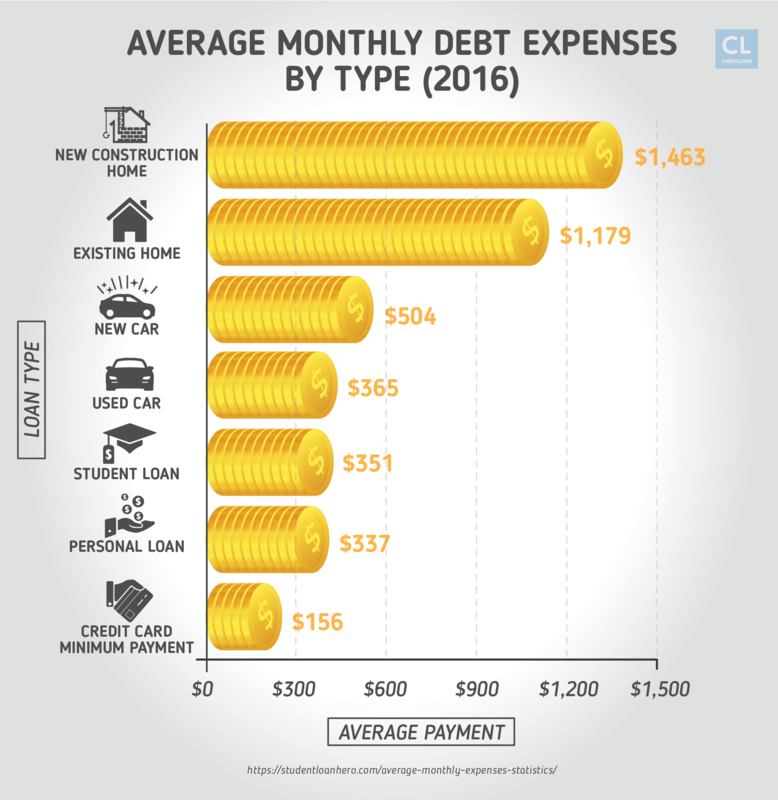 High-interest credit card payments, student loans, tax bills, medical expenses, utility and phone bills, and car loan payments can all contribute to a person's debt mix. Debt consolidation loans are the way to go. A debt consolidation loan has a few advantages and benefits in these kinds of scenarios. The way it works is, you get a single loan at a reasonable rate of interest and use it to pay off higher-interest credit card balances or bring together multiple sources of debt under one loan. One interest rate. You get a single interest rate, ideally less than the average of the interest you're paying on your other debts. A single monthly payment. You only have to be on top of one payment per month instead of several. Plan your repayment schedule. With rotating credit formats like credit cards, you just have to make a minimum monthly payment. You can pay back the rest over whatever timeline you choose, taking as little – or as long – as you want. With a debt consolidation loan, you get a fixed repayment schedule. You choose an affordable monthly payment and a fixed term (usually from one year to five years) to pay it back. The discipline you need to get out of debt. Often, the little bit of structure provided by a debt consolidation loan creates the discipline many people lack to pay off debt. The two best loan solutions for consolidating debt are personal debt consolidation loans and home equity loans. If you own your home and have been faithfully making mortgage payments for years, you are sitting on the best source of credit out there. Re-mortgage your home to free up funds. A home equity loan means you borrow back some of the money you have already put into your house. It's also known as a second mortgage. Use a home equity loan to wipe out debt. Calculate how much debt you are carrying, and get a home equity loan for the same amount. Pay off all your high-interest credit cards, student loans, car loans, and other bills. Then set up a fixed repayment schedule to pay off the home equity loan over time. Save thousands on interest. Usually, a home equity loan will be at a much lower rate of interest than any other form of credit, with the average fixed interest rate at 5%. Calculate your savings. If you need proof home equity loans work, I've got a debt consolidation calculator to help you crunch your numbers. Let's try a hypothetical example to see how a home equity loan can bring your debt together, save you money, and get it paid off quicker. Say you have one credit card with a balance of $5,000 and your APR is 18.9%. You have a second credit card maxed out at $3,000 and you're paying 17.99% APR. To add to the mix, let's say you are still owing $10,000 on your student loan at 4.99% APR. The combined monthly payments you're making on the credit cards is $320. The monthly payment for the student loan is $150. You get an $18,000, five-year home equity loan to consolidate all the debt together. Lower interest means you save. Instead of the average of 13.99% you were paying across your other debts, you pay 5%. By paying less than half the interest, you save more than $3,000 over five years. Monthly payments are not as steep. The monthly payment for the existing debt was $470. With this home equity loan, the monthly payment can be reduced to $340 a month. Fixed repayment plans get debt paid off on schedule. Since the repayment plan is a fixed monthly installment, you can be sure you'll have the debt paid off in five years. Go through your original mortgage holder or a completely different company. You can talk to the holder of your existing loan to see if it will provide you with a second mortgage. Or it can be as easy as finding an online company like Rocket Mortgage by Quicken Loans where refinancing your home can happen with a few clicks of your mouse. The other option for bringing all your debt together under a single loan is a personal debt reconsolidation loan. No collateral means higher interest payments. Since you're not putting up your house as collateral, the interest rate will likely be higher. Depending on your credit score, the interest rate on debt consolidation personal loans from banks is around 7-12%. Private lenders can charge anywhere from 14% for an unsecured loan to 3% for a secured loan. Flexible payment formats. You can choose to have a fixed or variable interest rate, and set up a fixed repayment schedule with a standard monthly payment. 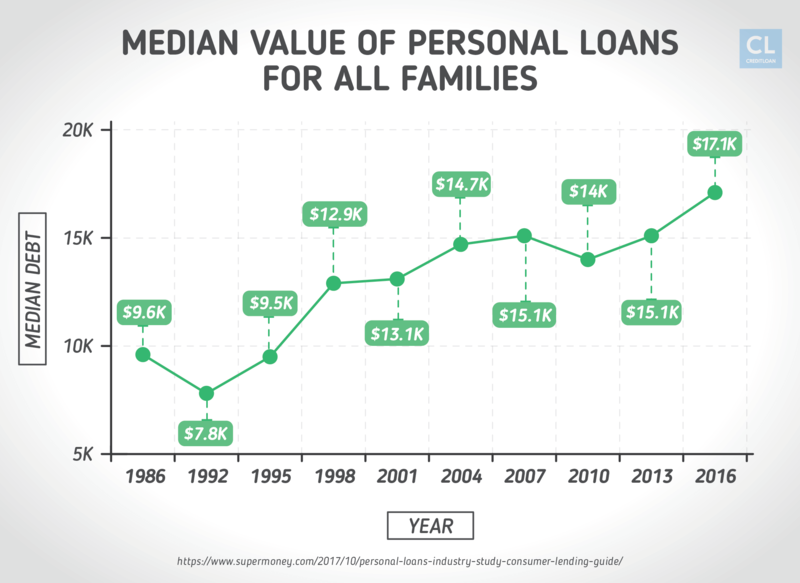 We can look at the same scenario we used to prove the effectiveness of home equity loans to calculate how a personal debt consolidation loan would work. You've got your $18,000 in combined student and credit card debt, at an average interest rate of 13.99%. The total monthly payment is $470. Take an $18,000 debt consolidation loan out, and pay off all three debts. Then pay the new loan off in monthly installments of $382 over five years. Multiple benefits from one decision. You'll save over $1,200 in interest, your monthly payment is less, and you'll get the debt paid off faster. One payment is better than three. Instead of having to stay on top of and submit three payments a month, you only have to deal with one. For many, education is the path to success. Few potential college or university students (or their parents) will have saved enough to cover the high cost of a postsecondary program. The student loan industry is huge. There are more than 44 million borrowers currently repaying $1.3 trillion in combined student loan debt in America. The average student in the most recent graduating class in the United States has $37,172 in student loan debt. 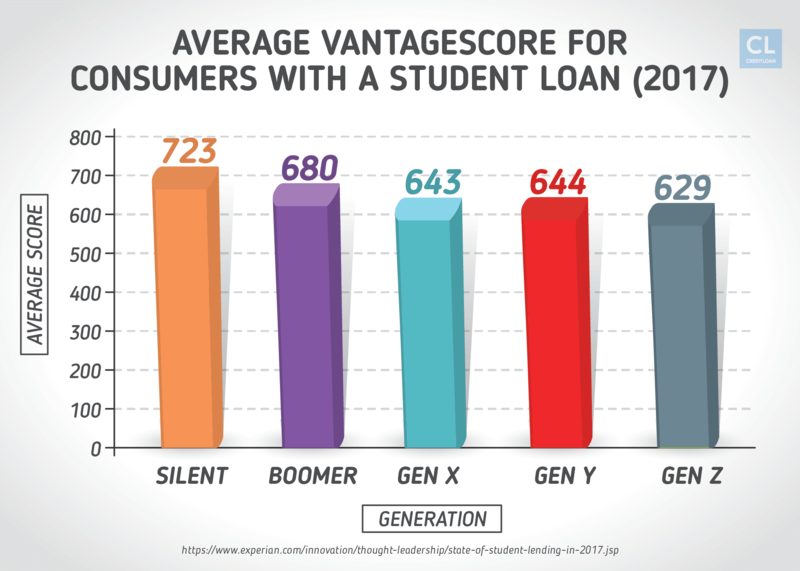 It might sound like I'm being negative about student loans by citing these stats. In fact, my wife and I both took out student loans when we were pursuing our respective educations. Besides being a resource to help us get our tuition paid, it was also the official start of our credit journey. The first step in a lifetime of credit. 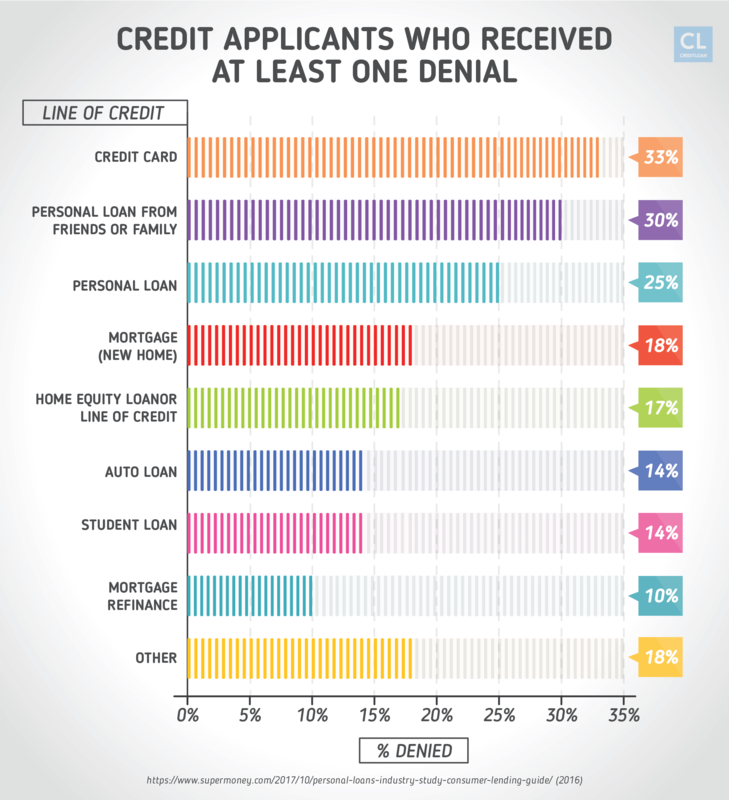 When people get a student loan they are often also starting to build their credit score. Points for good behavior. Credit scores are calculated based on your credit behavior. If you have no behavior, you don't get a score. For many going into college, a student loan will be the first form of credit they've ever received. This means the credit bureaus will start to receive reports on their payments. Every on-time payment increases the credit score a little bit. Successfully keeping on top of a student loan over the entire loan period can mean you come out the other end with a high credit score. Higher credit scores make life easier. A high credit score means you won't struggle to get approved for more credit after graduation, like if you apply for a mortgage or a car loan. You'll also get more favorable interest rates, which can save you a lot of money over your life. Here's proof credit scores make a difference. Let's look at how different credit scores could change the terms of a 15-year fixed mortgage to buy a $300,000 home. If you had a "Fair" credit score of 660 you might be offered the mortgage at an interest rate of 3.76%. For people who have an "Excellent" credit score between 760 and 850, the interest rate they'd be offered for the same mortgage could be 3.147%. The "Excellent" credit score borrower will end up paying $16,224 less interest than the "Fair" credit score borrower over the life of the mortgage. The stakes on those payments might be higher than you thought. Keeping up with student loan monthly payments are about more than paying for education. You're laying the foundation for what could be a strong, early credit history or a lousy one. It's important to know the different types of student loans available so you can pick the one most suitable for your financial situation and needs. The first group is loans administered by the U.S. federal government. These loans are generally lower interest, and it's possible to get approved without a strong credit history. The second group is student loans from private lenders and banks. Since there are caps on how much money a student can access through a government loan program, it is fairly common to see students receiving a combination of federal and private loans. Federal loans remove financial barriers. For students who might not otherwise be able to afford higher education, the government makes some affordable loan options available. No credit history? No problem. Stafford Loans are low-interest federal student loans suitable to students who have no credit history or a poor credit score. Subsidized and unsubsidized versions. Subsidized Stafford Loans don't charge interest to the student until after graduation. Unsubsidized Stafford loans start collecting interest throughout the time you spend in college. PLUS loans are for parents. Parents of students can borrow money to pay for their education through the PLUS Loans federal program. Parents need to pass a credit check or have a friend or relative endorse them. Poverty shouldn't mean exclusion. Perkins Loans are available for students in extreme financial need. The school the student is attending also contributes to the funding and the loan is long-term, low interest, and subsidized. Before you start looking into private student loans offered by banks and private lending companies, make sure you've applied for Federal Student Aid. If you're not eligible for Federal Student Aid, or if you've reached the max you can receive through those programs, private student loans are your next option. You might need a co-signer. For a student to get approved for one of these private loans, they have to pass a credit check. If they don't have a score yet, or their score is poor, they will have to find someone to co-sign for them. Pay attention to repayment options. Students don't start paying back federal loans until they've left school. Although some private lenders defer repayment until after graduation, it's rare. With private lenders, there could be several formats for repayment, and some are more affordable for student budgets than others. Repayment can commence immediately upon your getting the funds. If repayment on your student loan commences right away, you are going to be making payments while you are attending school. Other lenders will let you just pay the interest. If you can find a lender who will just expect you to pay the monthly interest on your loan while you're still studying, it will be easier on your budget. In my "Guide to Car Buying," I cited a consumer survey done by Autotrader. After asking 4,002 people if they like or dislike shopping for a car, only 17 people (0.42%) said they like car shopping. The remaining 3,985 respondents said they hated it. Buying a car can be stressful. A big reason people hate buying a car is the stress of negotiating the price. If you're looking at getting financing from the dealer, the lending terms are often wrapped into those stressful negotiations. Bank auto loans have a lot of variation. Generally, the banks are quite conservative when it comes to lending money for buying a car. A bank can be selective when it comes to approving a car loan. If someone is already a client of the bank and they have a good credit score, they might be offered a really good rate. Get behind the wheel with low interest and monthly payments. Banks are known to offer rates as low as 3% for a ten-year auto loan. The monthly payment could be as reasonable as $275 a month. Credit unions are a lot like banks, with one big exception: they are usually non-profit and owned by the people who bank there. Competitive lending rates. Since credit unions have lower operating costs, they can be competitive with banks when it comes to setting car loan rates. Sign-up for a membership today. The only catch is a credit union might only loan money to existing members. Online loan companies take your application and send it out to a whole network of lenders to bid on. You'll get multiple offers to choose from. Just make sure the company's legit. Be aware there are a lot of shady online lenders lurking around the internet. Check the company's rating with the Better Business Bureau. Otherwise, find companies through a trusted portal like Blumberg Capital's link page for reputable credit companies. Keep an eye out for fees. Make sure you're reading all the fine print, so you won't get hit with any unexpected upfront fees. A lot of the time the financing you're offered by dealerships is higher than the other sources we've listed here. It's because the dealership and the automakers are both looking to make a profit from the loan. Come equipped with other offers. If you bring along quotes you've received from other sources, you can often negotiate the dealership's rates down. It doesn't matter if it's a personal loan, a home equity loan, a debt consolidation personal loan, a car loan, or a student loan. Whatever loan you're going after, there are four steps you should follow right now to get the funds you need to achieve your dreams. Put together a plan for using the loan you're trying to get. Figure out exactly how much you need to borrow. Perform a self-assessment. Get your credit score and take a look at your situation. Tell yourself honestly what you can afford. Calculate the monthly payments you want to make. Make sure they are affordable. It's going to take some research on your end to find the lender offering the terms with the closest fit to what you're after. Do your homework. Look up online reviews for lists of the best lenders for the kind of loan you're looking for. If you're looking for brick-and-mortar lenders in your community the best place to start could be a search for "lenders" in your city on Yellowbook. Pre-approval is recommended. Get pre-approved by multiple lenders before you settle on one. Make sure there isn't a hard credit pull involved or your credit score will suffer. Usually, you will get a loan offer with specific terms when you're pre-approved. The actual loan application will require more information than the pre-approval. Have all your info handy. When you go to fill out the application you'll need your social security number, proof of identity, proof of employment or income (e.g. a paystub), and a bank account number for depositing the loan funds. Cross your fingers and wait. It can take anywhere from 24 hours to two weeks to hear whether your loan has been approved or not. When you are approved, the lender will send you an agreement outlining the terms of the loan. Review it carefully to ensure there are no unexpected fees or costs. When you put your signature on the loan agreement, it becomes official. Send it back to the lender, and you'll usually receive the funds within a day or two. I hope you've found this one-stop guide for everything you need to know about loans helpful. Every day I help people get the money they need to meet their goals and live their dreams. For most of them, borrowing money seems complicated at first. After I share what I know with them, they're no longer overwhelmed. They're ready to reach out for the funds they need. Do you have any advice or tips for handling loans?